Still the most popular hedging and screening plant around, Thuja Green Giant really gives its best in your garden. For a reliable, fast-growing and tough hedge, it can’t be beaten. When you have made the decision to plant this terrific evergreen, then timing is important, and the question of when is the best time of year often comes up from beginner gardeners. With plants growing in pots, it is possible to plant any time the ground is not frozen, and deciding when may not be a matter of choice – you need that hedge, and you need it now. The availability of potted plants makes that possible, None the less, there are good times, and not-so-good times to plant. The middle of summer, with its heat and dryness, is probably the worst time, as you will need to be watering almost constantly, and root-growth into the surrounding soil will be minimal. As for the best time, there is really no doubt, it is early fall. Let’s see why that is. We often say that when it comes to plants, ‘it’s the soil, stupid!’ With fall planting, that is certainly true. Fall often begins with an extended period of rain, and falling onto soil that is hot from the summer, the result is moist, warm soil – ideal for the growth of roots. Contrast that with spring planting, when the soil is cold and wet. If you live in areas where the frost goes deep into the ground, you might even have frozen layers still below the surface in spring, so you are effectively planting onto an ice pack. In that environment, water moves slowly, and there is little oxygen in the soil. Dangerous microbes thrive in these low-oxygen conditions, and they can attack the young roots of your Thuja Green Giant, setting up a struggle for survival that certainly slows down the establishment of your plants. In that warm, moist fall ground, good microbes are active, releasing nutrients, and protecting your plants. The roots divide and divide rapidly, and if you have prepared the ground well, they quickly penetrate deep into the ground. In contrast, the air temperatures of fall are low, especially at night, and it is a fact that the roots of your Thuja Green Giant grow well in temperatures that would stop the top growth all together. The top is prevented from growing by the cool air, so all the energy of the plant goes into establishing a wide and deep root system. In spring the opposite is true. Then the ground is so cold that even roots don’t want to grow, yet the warm days stimulate new shoots. It is easy to make the mistake of thinking that rapid growth of new leaves means your plant is doing well. If it is newly-planted, that may not really be true. Sooner or later the roots will have to catch up, or the top growth will suffer. If you have a spring heat-wave and drought, something that is common, then it is easy for the roots to dry out, fail to supply the leaves with enough water, and we see die-back. At the very least, you will have a lot of work keeping your new hedge watered. In fall, those first rains are almost always followed by more, so a steady moist soil is yours, with no work needed. The most common cause of poor establishment in spring is the rapid arrival of summer. Spring planting is often a narrow window, between frozen ground and summer drought. Spring flowers know that – which is why they burst out of the ground and flower so quickly. There is no time to spare. If you are a bit late in planting, or summer comes early, then your plants are not established, and you are facing a summer of endless watering, not what you want at all. In fall, we are pretty much guaranteed a couple of months of mild, damp weather. This gives your plants plenty of time to establish their roots, without facing drought or heat. Obviously a much better situation for good establishment. At this point somebody will be thinking, “But won’t my plants suffer in winter, if I plant them in fall?” This is a common idea, but one that is not true. If you live in a zone where Thuja Green Giant has no problem with winter (which would be zone 5), then neither will young plants. The earlier in fall you plant, the better – September beats November, without a doubt. The secret is to allow enough time for the roots to spread out and establish themselves, before soil temperatures get close to freezing, and root growth stops. But you have a big window, depending on where exactly you are – certainly from Labor Day to mid-October, and usually all the way to Halloween. Just a few weeks, under these ideal conditions for root growth, is all it takes. If you do find yourself delayed, and don’t plant until close to freeze-up, then spray your plants with an anti-desiccant coating, just to be sure. These treatments are excellent for evergreens, and they protect from winter-burn very effectively. Use them even on established evergreens if you want to see perfect green in spring, particularly in colder regions. The greatest thing of all about fall planting is that by spring, your plants will be ready to take off – and put on lots of strong new growth. They will have the root-development to support vigorous stem extension and a dramatic increase in height. Thuja Green Giants that are well-established when spring arrives can take advantage of the season to really get going, and they will take the summer much better too. You can pretty much guarantee that the same size plants, one batch planted in September, and the other in April, will not make the same growth. By the end of their first summer the ones planted in fall will be significantly taller and bushier than their spring-planted equals. It is from plants such as these that the measurements of over 3 feet in growth a year are taken. Fall planted, well-established by spring, and fertilized and watered as needed. Oh, there is one more thing. Nurseries often put their plants on sale in fall. So there are really substantial savings to be had. Plus, many sellers offer free shipping. As well, the plants you receive have already had a season being cared for by the nursery, so they are solidly the height advertised, and you get an extra ‘growth bonus’ too. Taken together, all these factors tell us that fall planting of Thuja Green Giant is the way to go. If you are planning a hedge, but thought you would wait till spring, think again, get your order in, and plant in fall. You won’t regret it. Instant Hedge, or Let It Grow? The decision to start small and grow a hedge from young plants, or invest in larger plants and get an instant result, is a perennial question the comes up with Thuja Green Giant, and other hedging plants as well. There is no ‘one answer fits all’, but there are certainly several considerations that help guide the decision. Let’s look at some of the issues, and the best way to handle your plants – big or small. It is obviously cheaper to plant a hedge with smaller plants, and the great thing is, that with Thuja Green Giant, the growth rate of young plants is high – they slow down as they get older. Young trees that are 1 to 3 feet tall might grow 3 or even 4 feet in the second year after planting – or in the first one if you plant in late winter. So they will often ‘catch up’ with larger plants. After 7 years, your small plants will be 10 feet tall, or more, and the ones you planted when they were big might easily be not much taller. That growth rate was demonstrated at the University of Arkansas, so it really is a reliable and accurate figure. Instant privacy is the usual reason for investing in large plants, in the 5 to 6-foot range. You know how it goes – you move into a new home, or perhaps a new one goes up next to you, and suddenly you are overlooked by neighbors. We all love our neighbors, but we don’t really want to become a reality TV-show for them, so the desire for privacy is natural. With 6-foot trees, you instantly gain privacy from anyone walking on the ground, and even from most ground-floor windows. The extra cost is often worth it, for the peace of mind you gain by an instant solution. On the other hand, if you don’t have an urgent need, then plant something smaller – they won’t take long to catch up, as we have already discussed. Use the money you save to buy beautiful and interesting shrubs and trees to decorate that beautiful private space you are creating with your Thuja Green Giants. Those trees and shrubs will grow along with your hedge, and in a few short years you will have a beautiful private garden to enjoy. When planting larger trees, there are some things to pay more attention to, so that you get the best and quickest establishment, and the fastest growth to add more feet to your hedge or screen. First, dig a wide area of ground for them. Three feet wide is not too much. One of the mistakes often made is to dig holes just big enough to take the root-ball, with little or nowhere broken up for the roots to grow into. This is a big mistake, and will certainly slow down growth very much. Instead, use a tiller to save yourself the work of hand-digging, and prepare an area 12 inches deep and 36 to 48 inches across. Add plenty of organic material, and a starter fertilizer as well. Break up the ground thoroughly, but don’t try to bring in new soil. That is almost always a mistake – put the effort instead into top-quality organic material, and dig in a layer 3 or 4 inches deep. When you plant bigger trees, it is best to dig a trench the width of the pots all along the planting area, rather than dig individual holes. You can more easily get the spacing even that way, and even spacing will give you a solid hedge quickly. Make sure to water the trees well the day before, and use a sharp knife to cut an inch or so into the root ball at three points around the root-ball and in a cross on the bottom, after you carefully remove the pot. Place the plants in the trench right away, and don’t lift them by the stems, lift the root ball, or you may cause it to break apart. Water thoroughly. Big trees will benefit from regular watering and liquid fertilizers during the first year, and always water the surrounding soil, not just at the stem, so that the roots quickly spread outwards. If you are using trees in the 1 to 4-foot range, the most common mistake is to plant them too closely together. Use the same spacing, no matter what size your trees are. If you buy a lot of small trees, and crowd them together, many will die, and the strongest will be slowed down by the smaller ones, that act like ‘weeds’ and steal water and nutrients. Over time they will naturally thin out, but not in the neat way you might like – more like a mouth of broken teeth! Even though your trees are small, still prepare the wide area we have already described. You want the roots to spread out and find water and nutrients from the surrounding soil, and they can do that best in well-prepared soil. The best spacing depends on the final goal. If you plan on keeping your hedge around 8 feet tall or less, then a 3-foot spacing is best. Those small plants are going to look too far apart, but really, this is the right thing to do. Without competition from each other they will grow wider, taller and be much healthier. They will grow so fast, before you know it they will be touching each other and building a strong screen for you. For a taller screen, use a 4 or 5 foot spacing. A double row, with 3 feet between the rows, and 5 to 8 feet between the plants, depending on the final height, will give you the thickest and densest hedge possible. Young trees have small root systems, so they really benefit from regular applications of a suitable liquid hedge fertilizer. Follow the directions on the brand you buy, and apply from spring to early fall, at the frequency recommended. With most liquid fertilizers, you can safely increase the frequency if you reduce the concentration. Double the frequency, but half the concentration is the usual rule. That way you provide a steadier supply of nutrients, and you will have taller, bushier plants by the end of the season. 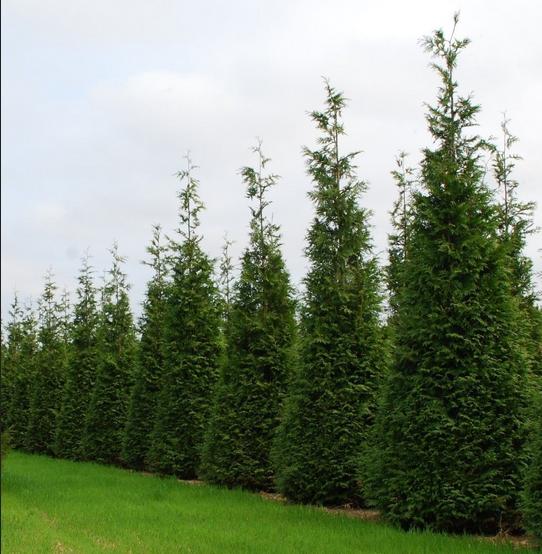 Whatever your choice – big or small – you can be sure that if you have chosen Thuja Green Giant for your hedge or screen, the result is going to be a gorgeous, healthy hedge or screen, rich green all year round, tough and reliable, and the perfect backdrop and privacy barrier for your garden. Almost everyone plants Thuja Green Giant as a hedge, or a screen. Trimming is part of the routine of keeping your hedges neat and tidy, and to do that well, a power trimmer is a great addition to your arsenal of gardening tools. It is worth buying a good-quality unit, as the savings in time and frustration will soon cover any extra dollars involved. Traditionally, the choices were between gasoline and electric trimmers, but today there are machines on the market that bring some interesting new options. If you have used a gasoline trimmer, then you know about the noise and smell they create. Added to that is a growing awareness of the environmental impact of the CO2 emissions as well. So while gasoline has the advantage of portability, these issues mean that gas trimmers are not as desirable as they once were. The second choice was electric, but the long cord trailing across the yard is always a problem, especially when you end up cutting it, bringing your trimming, and often all other household activities as well, to an abrupt halt. The relative peace and quiet were always a good quality, but that darned cord is a serious issue. In the past few years, as batteries have come to be used in more and more of our household items, battery trimmers have hit the market. These offer portability and quiet operation, but do they have the power and endurance needed for all but the smallest hedge? While prices have fallen a lot since their initial introduction, they still remain higher than for conventional trimmers, so you want to be sure you are getting value for money. What are the key features to look for? Right away, you should choose a trimmer with a Lithium battery, not a nickel-cadmium one, if you want reasonable endurance for your trimmer. Most Thuja Green Giant hedges are substantial, so you will need the extended time to get the job done in one go. If you trim a lot in one day, then having a spare battery, or one that will re-charge in less than an hour, is a way of extending your time on a smaller machine, so make sure you can by the battery separately. A longer cutting bar has two advantages. It cuts a bigger area, so you finish the job more quickly. It also gives you more reach, so when trimming higher up, or doing the top, you can reach farther without such a tall ladder, and you need to move the ladder more often. All these things add up to faster, more efficient trimming, so go for the longest bar you can. 24 inches is idea, but you may end up trading a few inches in return for a better machine. The big drawback with lithium-battery trimmers is the weight, which comes mainly from the battery itself. It’s impossible at this stage of the technology to have both light-weight and a powerful cutter, so be aware that you will be holding a heavier trimmer. Smaller machines weigh in at around 6 pounds, and the weight rises to almost 12 pounds in the most powerful ones. On a power basis, they are usually lighter than a gas machine, but heavier than an electric. Think too about where the battery is positioned, since you are waving a trimmer around a lot, and you need good balance to make that less tiring. This is the top-selling trimmer on Amazon, and with a price well below $100, it deserves its position. However the battery only has an estimated running time of 40 minutes, so it really only works for boxwood hedges and individual shrubs around the garden. A large hedge is beyond its ability. The slightly more expensive LHT321FF has a more powerful battery, dubbed the ‘Powercommand’, and offers longer life, but still the limitation of only 20 volts. This is a more powerful trimmer, with a larger, 40 volt battery that will trim both sides of a 300-foot hedge, 10 feet tall, on a single charge. Not only that, but the battery charges in one hour, so while you stop for lunch you can bring it back to a full charge. The main drawback with both the Black+Decker trimmers is that they cannot handle heavier branches, so you need to trim your hedges regularly. That way you are only cutting light-weight material, which these trimmers handle well. The Stihl brand pioneered battery trimmers, and while other brands might be catching up, they certainly remain on top of the game. Voted the Best Cordless Trimmer by consumer test sites, this machine has the power to cut through heavy material, and the balance to make that an easy job. Even with the smallest of its range of batteries, it will run almost 90 minutes, and with the strongest AR900 battery, it will last almost 8 hours. That option is probably only of interest to professionals, but the ability to choose the battery that suits you best is a big plus for this machine. Of course, there is a price to pay for the best, over $200 for the machine, plus up to the same again for the most powerful battery and charger. Still, if you want a machine that will handle the biggest overgrown hedge, this is the machine you want. If you don’t feel you need the full power of a Stihl machine, then this could be your best choice. Only $200 with the battery included, this machine will cut through ¾ inch branches, so if you haven’t trimmed your hedge for a while, you will be fine with this powerful machine. The battery will not give you anything like the time of the Stihl, but for most of us, that is not so important, as if we run out of power we can just come back the next day and finish up. In the end, like so much in life, you get what you pay for. 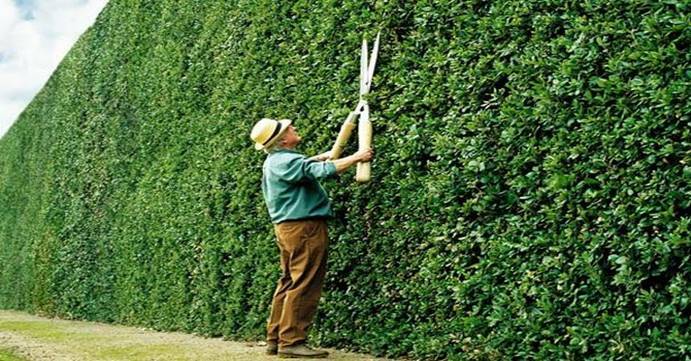 If your hedges are relatively small, the B+D options will probably work well for you. For larger, tougher hedges, the Dewalt or Stihl machines seem to be the way to go. Happy hedge trimming! Feeding your Thuja Green Giant is the best way to get maximum healthy growth. Along with supplying sufficient water, this is the best approach to take, and gives you outstanding results. In this mini-series of blogs we have looked in some detail at plant nutrients, so that you can make informed choices when you come to choose fertilizers, and see past the advertising spin. As promised last time, in this piece we will look at how to grow your plants organically. Using natural fertilizers in the garden has gone from being a slightly-suspect fringe activity a few decades ago, to main-stream gardening today. More and more gardeners are choosing organic sources for plant nutrients, because they want to be ‘green’ and environmentally responsible. Like all newer things, there are some common misconceptions around this, which we will try to sort out here, and give some solid guidance for this ethical choice. No matter how you choose to supply them – from a bag of manufactured chemicals, or from the chemicals released by natural products, your plants use exactly the same handful of minerals we described in the earlier parts of this series. For the plant, these are exactly the same elements, and there is no evidence that plants can tell the difference between where they came from. After careful analysis, it is also clear that plants do not need vitamins or any other complex nutrients – just those basic elements. That doesn’t mean that organic gardening and green growing are wrong. Not at all. Their emphasis is on the soil, not on the plant. What does that mean? Well, chemical fertilizers are designed and developed to deliver the chemicals needed by your Thuja Green Giant directly to the plant. They dissolve in the water in the soil, and are then absorbed through the roots, and sometimes through the foliage. Organic growing aims to build a healthy soil, with high levels of nutrients derived from the soil and the organic material added to it, so that your plants always have a good supply of exactly what they need. This more natural way of gardening focuses on keeping the soil healthy, and good plant growth follows – naturally. When we add organic material to our soil, we feed the natural cycles of decomposition and recycling that nourish all the plants growing in that soil. Organic material is the key to green growing, although we can sometimes use more concentrated natural materials such as sea-weed extracts, as boosters. Organic material is anything that was once alive, so all the parts of plants, plus animal waste. It can be garden compost you make yourself from garden trimmings, kitchen waste, egg shells, grass clippings, leaves, and even old wool or cotton clothing. 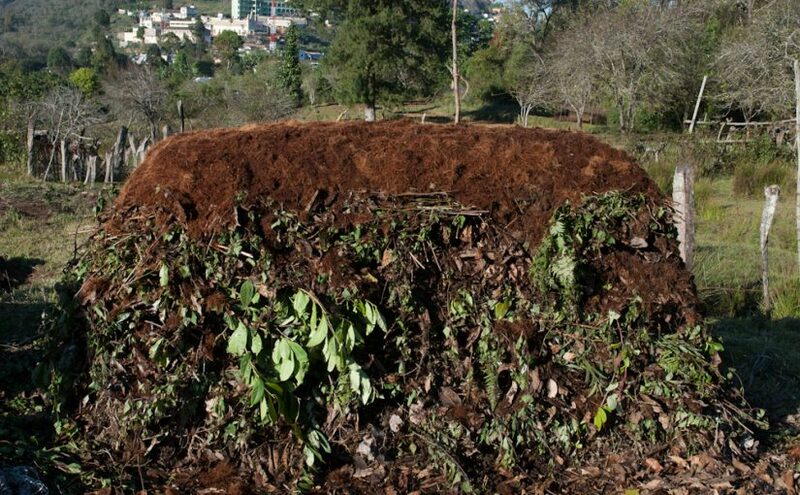 There are lots of places you can find out how to make your own compost, and it is a wonderful way to start gardening organically. If you live in a more rural area, you may have farms around you keeping cows, sheep, pigs or chickens. All these animals produce manure, which on most farms is mixed with straw and left to rot. If you can get some well-rotted manure, this is an excellent source of organic material for your garden. Never put fresh manure around your plants – it will burn them and can even kill them. Garden centers often sell rotted manures in bags, which is a very convenient way to use them, especially for a smaller garden. When added to soil, this organic material continues to decompose, helped by the multitudes of fungi and ‘good’ bacteria present in healthy soil. This decomposition releases the nitrogen we talked about in earlier blogs, that builds healthy, green foliage and shoots on your plants. Nitrogen gives you maximum elongation of the stems, and your Thuja hedge builds height quickly. The decomposing organic material feeds the good microbes, which then more effectively release nutrients from the soil itself. It also retains moisture, helping your plants stay healthy. As organic material decomposes, it turns into a substance called humus. This long-lasting material remains in the soil for years, holding nutrients as they are released from the soil minerals, and preventing them escaping in drainage water. The levels of good plant nutrients rise over the years – you get naturally healthier soil, and so healthier plants growing in it. To effectively grow your Thuja Green Giant plants organically, you should start before you even plant them, adding organic material to the soil when you prepare the planting area. Dig or roto-till a layer 2 to 4 inches deep into the planting site, mixing it well with the soil. This will release lots of valuable nutrients – more than enough to grow your plants well without needing any added fertilizers. To give young plants a boost, before they have spread their roots out into the surrounding soil to get to the nutrients from the organic material, you can use an organic supplement. One of the best is liquid seaweed. This is made from harvested kelp, which is a sustainable resource. Harvesting it doesn’t damage the environment, so you can use it while completely respecting the natural world around us. This liquid is diluted with water, and poured onto the roots of your plants, providing nutrients that are immediately available, and adding some longer-lasting ones to the soil as well. Once your plants are well-established, you don’t need to use it anymore, but keep some around, because diluted to a suitable strength it is a great food for everything from vegetables to flowers and even house plants. To maintain good levels of organic material in your soil, and so feed your plants for maximum growth and health, you need to replace material that decomposes. Periodically, you should add new material as a mulch over the soil. You don’t need to dig it in, just spread it beneath your plants in a layer 2 to 4 inches thick. 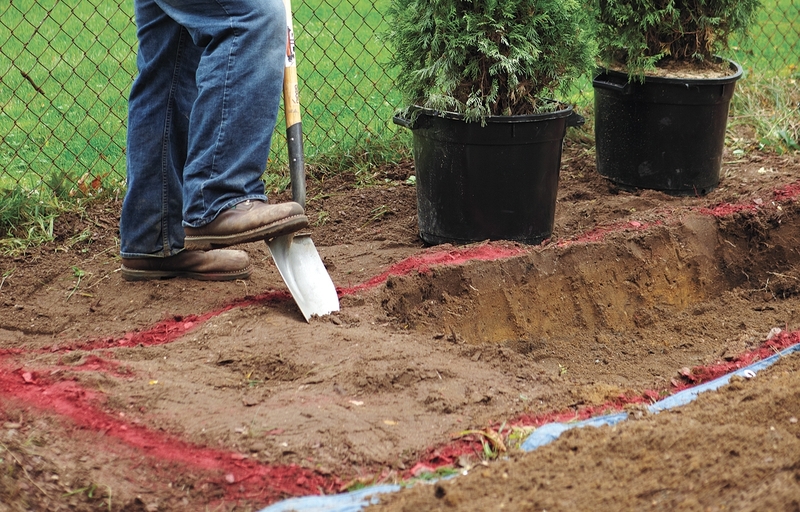 Cover the root area, extending out beyond the edges of your plants by as much as a foot. Not only will this material inhibit weed growth, and retain moisture, but organic mulch gradually breaks down, and works its way into the soil. On sandy soil and in high-rainfall areas, you may need to do this every year or two. On heavier soils, and in drier areas, every 4 or 5 years is probably enough. By taking care of your soil, keeping it rich and healthy, and full of good microbes, your plants will benefit. You will be growing them in a natural, sustainable fashion, recycling household and garden waste through composting, and putting animal waste to good use, keeping it out of our rivers and lakes. This green approach to growing your Thuja Green Giant plants is certainly the natural way to go. A well-planned fertilizer program for your Thuja Green Giant hedge can make the difference between simply good growth, and spectacular, dense and healthy growth, giving you a solid hedge or screen several years earlier than it would otherwise happen. In this mini-series, we have been looking at fertilizers, not just saying ‘this one is good’, but giving the basics. If you understand plant nutrition, then selecting a fertilizer from the array available becomes a thought-out activity, not a hit-or-miss process. You can tailor your choice to what you know your hedge needs, depending on how it looks, and at what stage it is growing. You can make smart price choices, and understand the value of certain ingredients. As well, you have the pleasure of knowing more about your plants, and realizing that good gardening is something that can be learned, without the required ‘green thumb’. In the first part of this series, posted last week, we looked at the ‘Big Three’, the major plant nutrients – Nitrogen, Phosphorus, and Potassium – that figure in the three numbers of the Fertilizer Ratio on every bag of fertilizer. We looked at what they do, and their roles in the good health of your plants. To summarize that, we can say the Nitrogen is the ‘growing’ nutrient, that causes shoots and leaves to develop; Phosphorus is the ‘rooting’ nutrient, that helps your plants develop strong, extensive root systems; and Potassium is the ‘protecting’ nutrient, that strengthens cells, and makes them more resistant to cold, insects and diseases. Now let’s look at some of the important minor nutrients, which, like vitamins for us, are only needed in small quantities, but which are just as important as those Big Three. There are several nutrients that are used by plants in moderate quantities, although a lot less than N, P, K (these are the scientific symbols for the Big Three). These are Calcium, Magnesium, and Sulphur. Only in very acidic soils, with pH values below 5.5, can there be a lack of calcium and correcting that is not a matter of fertilizer, so we will put that one aside. Sulphur is present everywhere, and is almost never an issue for plants. That just leaves Magnesium. We all know about the ‘wonder chemical’ called chlorophyll in plants that turns sunlight into sugar. It is what makes leaves green, and it is what feeds everything on the planet, directly or indirectly. Inside the heart of this big molecule is a single atom of magnesium. Without enough of that metal, no matter how fast the plant tries to grow, it will not be able to. Plants can rob older leaves to feed the more important younger ones if magnesium is in short supply, and Thuja will do that, leaving the older parts of the stems yellow instead of green, while the growing tips still look healthy. This is not very common, mainly because most good fertilizers include magnesium in them. Look for the letters ‘Mg’ to find out if the fertilizer you are looking at has some, which will usually be listed as a percentage. It doesn’t have to be very much, and sometimes it isn’t even needed, but it’s good to see some in there. These nutrients are also called ‘trace elements’, and both names tell us that they are only needed in minute quantities. These are sometimes called ‘vitamins for plants’, because they are just as important to plants as the big nutrients, but only tiny amounts are used. There are several, but only a couple are of importance. Iron, boron, manganese, zinc, copper, molybdenum, nickel and chlorine are the micro-nutrients that plants need, bringing the total needed to just 14 elements. Others are sometimes listed, but at this point those are not strictly essential, as they can be replaced with one or other of the 14. From a practical point of view most of this list can be ignored, since some, like chlorine, are so widespread that it is almost impossible to even demonstrate in hydroculture that they are essential. Nickel is needed only in very, very, minute quantities, and it need special equipment to even detect such small amounts. In most parts of the country, boron, manganese, zinc and copper are common in soil, and no supplements are needed. That just leaves iron, which we will look at in a moment. Because it is hard to decide how much of these nutrients are needed, in modern fertilizers they are almost always simply included in small amounts. You will usually see them listed somewhere on the bag, given in ‘ppm’, which stands for ‘parts per million’. This is a commonly-used way of expressing very small amounts of something. 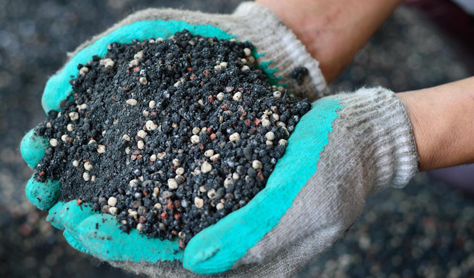 Only the cheapest fertilizers will have no micro-nutrients, and the good news is that the materials in them will probably be a little impure, so they will be ‘contaminated’ with enough of these elements to provide your plants with what they might need. This element is the only micro-nutrient that is regularly needed by plants as a supplement. We said that magnesium is in the chlorophyll molecule, well iron is in the enzymes that make chlorophyll, so no iron means no enzymes, which in turn means no chlorophyll. However the difference is very easy to see, because iron deficiency shows up on young, new shoots, which turn pale yellow. Like the other micro-nutrients, iron will often be in fertilizer you buy. Look for the letters ‘Fe’, which is the chemical symbol for iron. To get maximum growth from your Green Giant Hedge, iron is an important additive, since it will give your hedge that rich, lush green color that makes such a perfect backdrop for your garden. Nobody wants a pale hedge, and making sure you are adding iron will prevent that. This is by far the most common micro-nutrient deficiency seen, especially on soils that are alkaline, or if you have recently put down a lot of lime, hoping to improve your soil. Enough for Now. . .
We seem to be on a roll here, so next week we will look at using organic fertilizers on your Thuja Green Giant hedge.